Last weekend Ryan & I traveled the four hours to Dallas specifically to love on my God mother, Pat. A few days earlier Pat had her left knee replaced (last year she had her right one done) and we wanted to be there to support her. My mom also traveled from Kansas City to be her personal nurse. Even though Pat was in a lot of pain, I think having family around her really helped distract from the pain. Both my mom and I brought lots of goodies to help cheer her up. I just couldn't imagine having to go through something that painful. Pat is one strong woman! Everyone surrounding Pat with their love. Me, Brad, Rocky, Susan, Mary (my mom), Pat in the middle, and Ryan taking the picture. Even before Pat's surgery she had outdone her self with putting up this gorgeous rotating tree, plus many other Christmas decorations AND food! I felt bad that she went to all that trouble before her surgery because she knew we were coming. About 99% of her ornaments are all hand made by various family members. My mom has many of them too and I remember playing with them as a kid. I would specifically place certain ones in the best places on the tree. One of the treats I brought Pat were some special cut out sugar cookies. 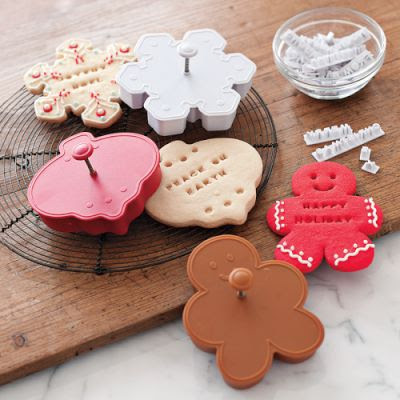 My friend, Katie, had given me these cookie cutters from williams-sonoma as my Christmas gift. I put them to good use. I even personalized some specially for Pat. Katie liked them so much that she went out and bought herself the cookie cutters too! Those are really cute cookies. I love Sonoma's stuff. There is a really neat one in West Des Moines and I always go there and buy way to much. (we go there yearly for a soccer tourney). That rotating tree is so cool. I have heard about them but never seen one. I would love to have one with all of my ornaments. Praying Pat has a quick and easy recovery. I have known people that have had that done and know it is a difficult procedure. These are adorable! My mom just bought these cookie cutters and has been playing with different variations. I can't wait to direct her to your post!